The most identifiable and typical ragù may be Bolognese Ragù but they’re not the only game in town. The region surrounding Bologna have many variations. There’s also a distiction between the northern style (Bolognese) and southern (Napalese). The northern style typically uses chopped or ground meat which is cooked with a sautéed soffritto. Usual meats used are beef, veal, pork and chicken but some even use lamb, duck, goose, mutton or various game. There are many versions that don’t include tomatoes making it more of a stew. In the southern versions, it’s typical to use larger chunks of meat and braise them. This braising procedure his has led to the translated term ‘gravy,’ which many Italian Americans argue about whether it’s a sauce or a gravy. Since our nonna called it gravy, we’re sticking with that. For this recipe, which we consider as a marriage between the northern and southern styles, uses ground veal and sweet bell peppers. 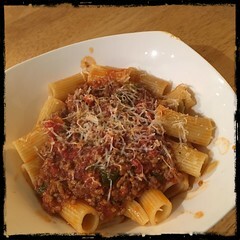 We believe they compliment each other splendidly giving this Ragù a naturally balanced savory and sweet flavors. 1. Preheat 1-2 tbsp olive oil in a medium to large sized dutch oven (or sauce pot). Cook the the pancetta until browned. 2. Once the pancetta is browned, add the onions, garlic and optional hot pepper flakes. 3. When the onions show signs of transparency and the garlic has softened, add the ground veal. Mix frequently and season with a bit of salt and pepper. 4. Once the veal browns, add the bell peppers and let cook for 5-10 minutes or until the peppers soften. 5. Once the peppers have softened, add the tomatoes, let cook for 10-15 minutes. 6. Add a cup of water or chicken stock (if needed) and bay leaves, let return to a simmer. 7. Once the ragu is simmering add 1 8 oz can of tomato paste, let cook for another 5-10 minutes. 8. Once the ragu is simmering nicely add one cup of white wine, let it return to a simmer and cook for an additional 10 minutes or so. 9. Taste often as the ragu cooks, add salt and pepper, as needed. 8. When you feel the seasoning is about right, add some fresh basil and the lemon juice. 9. For the final stage, let the ragu cook for as long as you wish, taste frequently and add salt and/or pepper to your liking. You may need to add some more water if the ragu get too thick. 10. Serve over pasta with grated Pecorino Romano cheese on top.